Our smart professionally designed Realtor Script is the best theme concept to organize and publish the properties in the site that will reach the end user effectively by responsive front-end layouts and friendly users interactive process, management of property posted in the site. For the easy find of property integrated Google map which will be helpful to you for the tracking of property. Through the admin panel can easily access the submissions of add, edit or delete the properties. 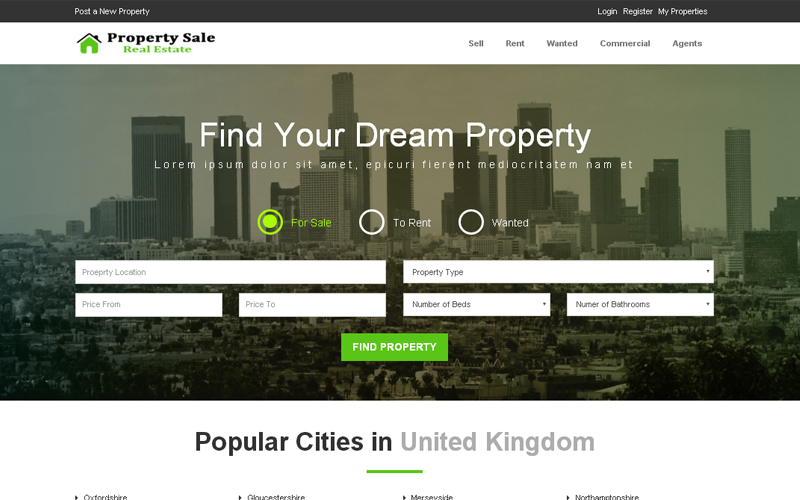 In this Realestate WordPress Theme, a user can access once register with the system then start a search by on the property type, purpose of use, a budget of price, an area where the land is to be present and search by keywords for an easy access. For a quick search in home page, there is a detail of specified country’s cities based property and latest properties with agents details. The user also can change as an agent and post the property on the site to view. Users and agents can get the contact help support from the admin through the simple UI form. We developed Realestate Portal Script based on premium support provides high-level responsive browsing experience to the users. Enabled with SEO friendly engaging solution those make you publish behind the screen. We are offering the wide period of services in our brand free product to you for the enhancement of your business in the right path with 1 year of tech support and 6-month free update. real estate agents, property services,property for sale or rent. I thank PHP scripts mall for this awesome script because it has got all the features which I needed and the customizable property is too good for me. The schemes and advantages provided by the company were simply superb. I ask others also to buy this script and encourage your friends also to purchase this script. This script is a master piece. I never saw a script like this one. A lot of options, minimalistic designs and simply perfect feature. Thank you so much I’ve been wanting a script like for this for years. Gorgeously seek and so many customization options. Well done!! !